enjoying the cooling shade of our California bougainvillea. Her duality has carried over to her sons and daughters. Lure Coursing: A functional activity to stimulate the natural chase instincts of our hounds. SUNSTAG (Reg.) feels this to be one measure of our breeding program and the conditioning required for coursing could be a factor in our above-average longevity range. 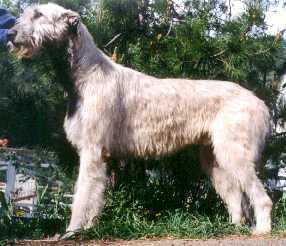 PUPPIES grow, like acorns, into mighty hounds of "great size and commanding appearance". This 1995 14-week old pair have been entered into our breeding program for the 1997 winter season. Ce-Ce (left), Sunstag Celebration, is actively being shown and coursed. Dezi (right), Fenrier's B-Sunstag By Design, was imported from Germany to add more vitality to an already strong line. He is currently being campaigned in conformation and is a lure coursing champion. One of SUNSTAG (Reg.) Champions, Dual Am/Mex/Int'l CH MacShoi Bonnie Blue Sunstag, Fch/LCM/SC, shown here as a 3-year old, offers you a look at the typey outline and "symmetry" as noted in The Standard, to which all breeders strive. Father and Son duo performed like troupers! Lovely Lacey managed to control them all the way to BEST IN SHOW! Just a day in the sun for SUNSTAG(Reg.) hounds. The kennel site is within the Cleveland National Forest, just 30 minutes from Disneyland. 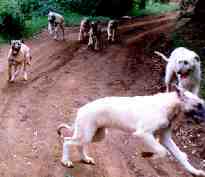 The hounds are taken en masse for hikes into the forest which, we feel, aids in their conditioning and fitness. 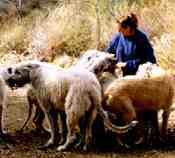 "Joss" is in forefront; click for his stats. PUPPIES at play! They, too, enjoy the wide open spaces of our adjacent hills and mountains. 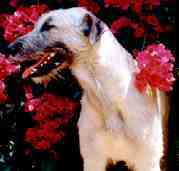 It is good exercise, builds confidence and helps develop the muscling so important in a coursing hound.